Each of these will give your civilization a specific ability. Some will allow you to advance through the ages faster, others will help build your infrastructure, and yet more will give you the ability to attack your rivals. 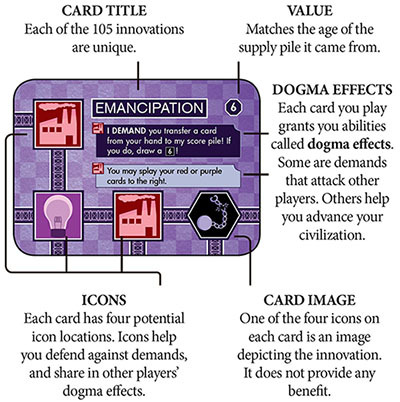 Each of these innovations is depicted in the game by a card, and all 105 are unique. There are no maps or pieces to move around, as the cards provide all of the action and score keeping in the game. 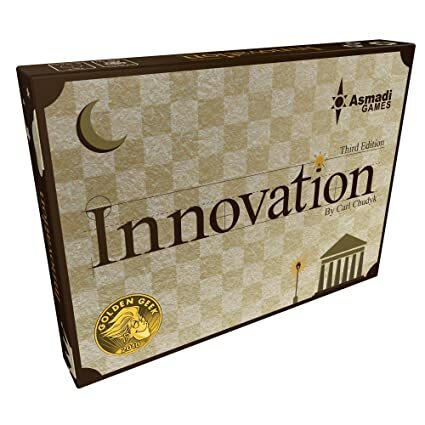 A card's primary use is as an innovation, played face-up in front of you to be used for effect, but cards can also wind up face-down in your score pile or as achievements, representing your civilization's power, influence, and legacy. Several cards have been rebalanced for the Third Edition. They are Oars, Fermenting, Feudalism, Measurement, Societies, Statistics, Industrialization, Combustion, and Fission. The game of Innovation takes many plays to master. Its basic mechanics aren't too hard to explain, but the 105 unique cards and their different effects can be overwhelming to new players. Before teaching the game to others, it is often helpful to play through a few turns on your own. For a first play, it is best to do 2-3 players, and to focus more on what's going on on your own cards rather than trying to read every card that opponents play. There's a ton to explore, and the time you devote to the game will be rewarded in future plays! For some tips on how to teach Innovation to others. There are two primary ways to win. The first, less frequent, way is to have the most points when time passes beyond age 10. You will acquire points during the game by using the effects of your cards. The second way to win is through achievements. If you have enough points, you can spend an action to claim an achievement. And if you have enough achievements, you win immediately! 2 Players/4 Player Teams: 6 achievements to win. 3 Players: 5 achievements to win. 4 Players: 4 achievements to win. As you play, you will accumulate cards of five different colors in an area in front of you called your board. Your most important cards are the top cards of each color, as they can be activated for their effects through the Dogma action. Cards that you cover up over time are still useful, because some effects will allow you to splay a color in a direction. Splaying will reveal additional icons from your covered up cards. Your board consists of all the cards you have put into play. Visible icons will help you share in other players' actions, demand from opponents, and also defend against their demands. In this example, blue is splayed right, and purple is splayed left. Your score pile contains face-down cards. Each card is worth its value (the age number) in points. Achievements are one way to win in Innovation. Once claimed, they can never be taken away from you. Split the cards into their ten supply piles, arranged like a clock as shown below. Randomly and without looking, set aside one card each from ages 1-9 in the center as normal Achievements. Ihe five Special Achievements are placed nearby. 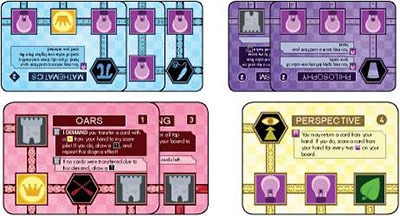 Each player draws two age 1 cards, and all players simultaneously choose one to be the first card on their board. The other card becomes their initial hand. The player with the card in play closest to A alphabetically goes first. Ihe first player (or the first two in a four player game) will take only one action instead of two on their initial turn. Subsequent turns are normal. On each turn, you must take two actions. There are four types of action you can choose. Draw: Add a card to your hand from the supply piles. Cards in your hand can later be melded, or sometimes used to fuel dogma effects. Meld: Take a card from your hand and put it onto your board. 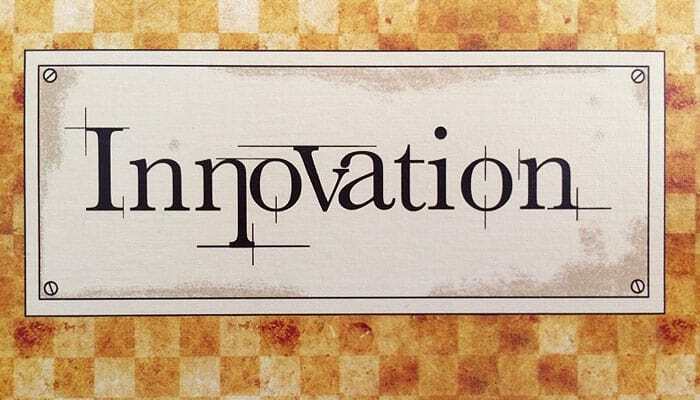 Dogma: The core action of Innovation. It allows you to activate one of the top cards on your board for its game effect. These effects do many useful things, including placing cards in your score pile. Achieve: Allows you to claim an achievement, if you have enough points to do so. Achievements are the primary way to win! Your two actions each turn can be any combination in any order of these four actions, including the same one repeated twice. To take a Draw action, find the highest value (a card's value is its age number) top card you have on your board. Take the top card from that age's supply pile and add it to your hand. Empty Supply Piles: If a supply pile is empty and you need to draw from it, instead draw from the next higher non-empty pile. This happens both for Draw actions, and for any other effects that cause you to draw cards. For example, if you need to draw a 4, and the 4,5, and 6 piles are empty, you would draw a 7. If you ever are required to draw a card of age higher than 10, the game ends immediately. Choose a card from your hand and place it on your board, on top of any other cards of its color if present. If that color of your cards is already splayed, the new card continues that splay in the same direction. You can choose any card from your hand, even if its value is much higher or lower than your existing top card of that color. age number of the achievement. Second, you must have a top card of equal or higher value to the achievement you want to claim. If you meet both these requirements, claim the achievement, placing it under your reference card on the right side. Claiming an achievement does not spend any points, they are merely a threshold required to take it. Once you have an achievement, it cannot be taken away. When you take a Dogma action, choose one of your top cards to activate. This represents your civilization focusing on one of the innovations you have discovered. The Dogma action is the central mechanic of the game. Each dogma effect is preceded by a small version of one of the six possible icons, indicating which is its featured icon. At the start of a Dogma action, each player counts how many of the featured icon they have on their board. Each player that has at least as many as you is eligible to share in the use of your innovation. They are also immune to its demand effects, if it has any. Many cards have multiple effects. You will use all of them with a single Dogma action. Do not recount icons after each of the effects, it only matters how many icons were present at the start of the action. Always complete an effect entirely before proceeding to the next effect. Before you execute an effect, each other player who is eligible to share must also use it. Starting to your left and going clockwise, each of them follows the effects instructions. Then you perform them. If the card has additional effects, repeat this process, including sharing, for each effect. After your Dogma action is completed, if any player shared any of your effects, you take one free Draw action. This only occurs if an opponent's use of the shared effect caused something in the game to change. A change is one or more cards being drawn, revealed, melded, tucked, splayed, scored, exchanged, or moved. Some effects are demand effects. They are in darker boxes and all start with "I demand" These effects are attacks, and you read them aloud to make it clear what your opponents must do. In clockwise order, each opponent follows the instructions. Opponents who have at least as many of the featured icon as you ignore demand effects. If you can only perform part of an effect, do as much as you can and ignore the rest. A demand requiring your three highest cards would take your entire hand if you only have two cards, for example. An effect that exchanges your hand and score pile still takes place if one of the two is empty. You are allowed to use the Dogma action on a card that will cause nothing at all to happen. 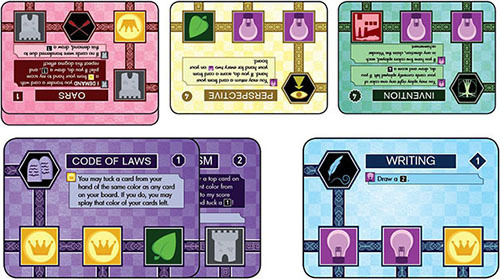 In this example, I have Writing and Code of Laws (which I've already used to splay my purple cards left!) I want to take a Dogma action in order to use Writing ( Draw a 2). Since my opponent has at least as many of the featured icon as me, they are eligible to share. They draw a 2, and then I draw a 2. After the Dogma action is complete, since any opponent shared in my effects, I get a free Draw action. My highest top card is a 1, so I draw a 1. Bottom: The bottom card of your stack of a color. If you have only one, it is both the bottom and top card of that color. Card Image: The image in a hexagon on a card, depicting the innovation. 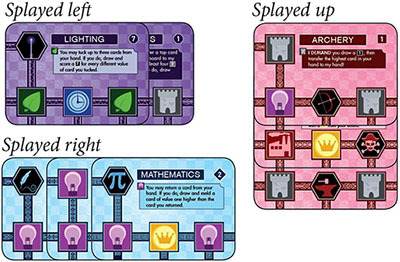 These icons have no effect on the game other than to vary which splay direction utilizes the card best. Draw and X: Many dogma effects instruct you to draw and tuck, draw and meld, or draw and score a card of a specific value. For any of these, draw a card and then immediately do the second part with that card. Remember that if a supply pile is empty, draw from the next higher available pile instead. Exchange: Swap cards from the two locations given, even if one half of the exchange is empty. Exchanging cards does not count as scoring them for the purposes of Monument. Execute for yourself only: Do not share such effects, regardless of icon count. The effects can still impact other players (ex: Rocketry), just not by sharing. Fun: Mandatory! You must have it, or else. Highest/Lowest: Refers to the value (age number) of the cards in question. In the case of a tie, you can pick which of your cards are affected. Non-demand effect: Any dogma effect that does not begin with "I Demand". Remove: The Fission card, if successful, forces the removal of all score, hand, and board cards from the game (set aside in the box). Civilization begins anew with the few cards remaining in the supply. Return: A returned card is placed at the bottom of its supply pile, face down. If multiple cards are returned at once, choose the order. If the pile was empty, it now exists again. Score: To score a card, place it in your score pile, face-down. Your score is the total value of all the cards in your score pile. Top: The top card of each color is the completely visible card. Tuck: To tuck a card, place it on the bottom of the matching color pile, continuing a splay if possible. If no cards of its color are on your board, it forms a new pile. Value: The value of a card is its age number. If a card refers to the value of something you don't have, like your top purple card if you have none, treat the value as 0. Win and Game Ending Effects: Several cards can end the game early. Some allow you to win given a certain condition, which if satisfied ends the game immediately. Others let "the single player with the most X" win. These also end the game immediately, but only if there is no tie for X. If there is a tie, the effect is ignored entirely. In this example, I have Oars and want to use its Demand effect. Since I have three of its featured icon □ compared to my opponent's one, I read aloud the effect. Sadly, they have no matching cards in their hand, so nothing happens. However, Oars' second effect (a non-demand dogma effect) reads "If no cards were transferred due to this demand, draw a 1", and so I am able to salvage a card draw out of the situation. This non-demand effect would be shared by any eligible players. Many dogma effects will instruct you to splay a color in a direction. At any given time, a color is either unsplayed, splayed left, splayed right, or splayed up. To splay a color, take the top card and slide it in the direction indicated, revealing one icon if splaying left, two icons if splaying right, and three icons if splaying up. If there are more than two cards, repeat the process so that all cards in the color are splayed. If the color was already splayed, unsplay it before splaying it in the new direction. If a color contains zero or one cards, it is always considered unsplayed - so if a splayed color is reduced to zero or one cards, it does not remember that it was previously splayed. Below are examples of purple splayed left (two cards), blue splayed right (three cards), and red splayed up (three cards). 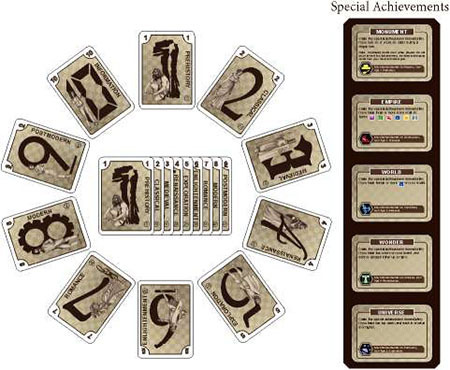 Over the course of the game, you will accumulate cards in your score pile through dogma effects. Each card in your score pile is worth points equal to its value (the age number). When you slide them under your reference card, the number will be visible in the top left. Your score is the total value of all these cards. Nine normal achievements are available to start the game, one of each from ages 1 through 9. You can claim an achievement with the Achieve action, if you have enough points and a top card of the achievement's value or higher. Once gone, they are not replenished. You do not have to claim them in order, and on occasion it is strategically better to take a higher achievement first. The five special achievements are always available to be claimed. If you meet the conditions for one of them, take it immediately. Like normal achievements, once claimed they can never be stolen. In the rare case that two players simultaneously become eligible to claim a special achievement at exactly the same time, the tie is broken in turn order going clockwise, with the current player winning ties. To win, you need to claim a number of achievements depending on how many players are in the game. For a two player or team game, 6 achievements. For three players, 5 achievements, and for four players, 4 achievements. These can be a mixture of regular and special achievements. If nobody has won yet and a card higher than age 10 must be drawn (if the 10 pile runs out, or through some dogma effects), the game ends immediately. In this case, each players current score is more important than achievements, as time has passed by their relevance. The player with the highest current score wins. If tied, most achievements wins. If still tied, the game is a draw. With four players, you can play in teams. This creates a more stable four player game, if that is what you are looking for! In a team game, demand effects are not executed by your teammate, and if you share a non-demand effect with your teammate only, you do not get a free Draw action. Any dogma effect that refers to 'opponent' does not affect your teammate. To win, your team must get 6 achievements combined (you claim achievements without your partner's score), or have the highest combined score when a player tries to draw a card higher than age 10.